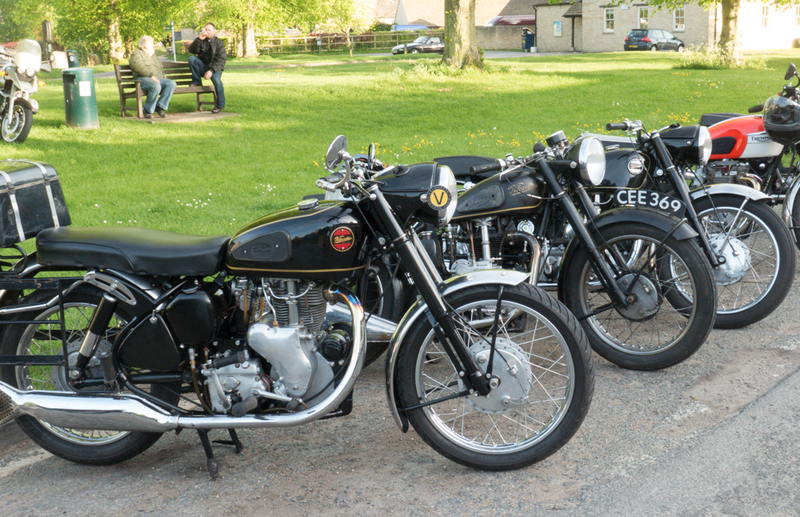 The monthly Classic Car and Bike Meets at The Norman Knight at Whichford have once again resumed and the 2nd this year will be held on Thursday May 21st from 18.00 hrs onwards. This will be repeated until September. The Norman Knight has a new owner and he is keen to encourage the event with an outside bar and a bbq. Anyone wishing to co-ordinate a run to Whichford let me know the details, otherwise make your own way there and enjoy the evening, it is always good fun with a wide and interesting variety of machinery (se previous posts). I am unable to attend the event this month. “7 members of the Oxford section turned up at our last meeting (Monday May 11th) including 3 on Velocettes (1 MAC, 1 Viper and 1 Venom) and 1 on his Brough Superior. The clutch on his Venom was giving problems so he rode his Brough…..
With the weather being warm and dry we met outside the Red Lion and enjoyed chatting with the members of BMRCO who turned up on a wide variety of machinery. One other VOC member promised to take his Viper out of the VAC bags before the next meeting and one more made a commitment to “just get it on the road” so hopefully the number of Velos on show will increase. The British Motorcycle Riders Club (Oxford) will once again host “The Best of British Bike day” event. It will be held at The Red Lion in Cassington on Saturday May 30 th from 11.00 am to 6pm. 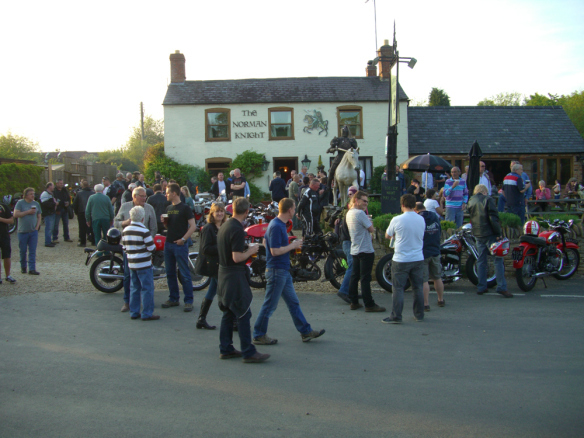 All British bikes are invited to park up at the rear of the Red Lion whether ridden by a club member or not. If you tip up on a non Brit bike then park at the front of the pub along the road. This is the 3rd year the event will be organised and it is a very relaxed affair whereby we can enjoy our rich British motorcycle heritage. No entry fee, no judging, just turn up and enjoy. For information and photos of previous events check out the information posts from 2013/4 on the BMRCO website. This year the featured marque will be BSA and any British competition bike. Motorcycles that fulfill either or both of these criteria are invited to gather appropriately in the pub garden. By competition bike this means any bike that has seen the heat of competition whatever that may have been. This gives you the opportunity to wheel out the (British) sprinter, trials, roadrace, grasstrack bike on which you competed all those years ago but otherwise now keep in your shed. Do invite anyone you know who has such a bike to come along, they will be assured of a warm welcome. The Red Lion will organise a BBQ and of course is always happy to dispense liquid refreshment. If you have any questions about this event please either contact me (Graham Lay). Contact details are to be found on the site). In 2014 we had 19 velocettes in formation….